Thanks first to Johanna Draper Carlson for sending me a copy of The Broadcast by Eric Hobbs and Noel Tuazon. 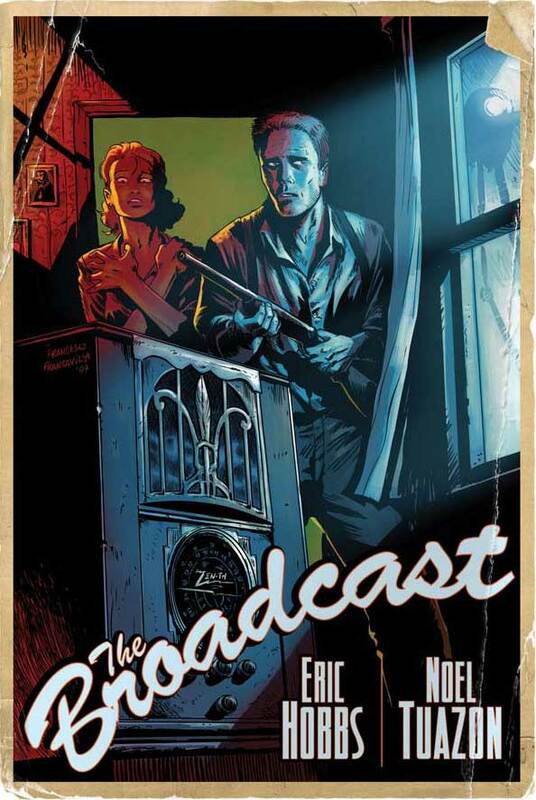 You know the basic story of Orson Welles' "War of the Worlds" broadcast, right? Welles and his radio troupe staged a loose adaptation of H.G. Wells' novel of the same name. The presentation was done in a style that resembled actual news reporting, and many listeners who tuned in late never heard the announcement that it was a work of fiction, therefore assuming it was a real broadcast. Hearing of this dangerous alien invasion frightened a number of people, and it's been estimated that nearly 2 million listeners believed the show to be true. However many people actually panicked to the point of behaving dangerously is a matter of some debate, but it's safe to say that a good number of people were fooled. Anyway, that's the backdrop for The Broadcast. The main story takes place in a small Indiana town where things are going pretty much as normal for the townsfolk. They're struggling to make ends meet, they're trying to get out and make something of themselves in the world. They have their own desires, which aren't necessarily in line with everyone else's. They have their own personalities, which don't always mesh well with others'. And that's really the key to this book. There are several characters here who all have distinctly different relationships to one another. None of whom feel like stereotypes or cliches. Which is impressive given A) the number of characters in the story and B) the ease with which some of the characters could have been written as cliches. Jacob, for example, is the resident "heavy." He's clearly upset about his situation (having to literally beg his neighbors to help feed his family) and has a lot of anger directed towards the local wealthy land-owner. But while he acts in despicable ways throughout the story, he's still trying to do what he can for his family and, in some meager ways, acts quite honorably. The way young Gavin acts around and towards his girlfriend's father is another example. He's clearly intimidated and nervous, but still refuses to back down from the older/richer/more powerful man. And, while he is willing to do anything for the hand of his girl, he still maintains a strong relationship with his own father. 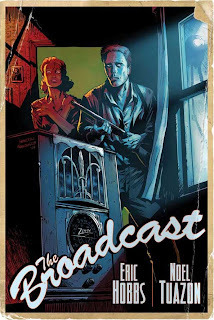 A storm knocks out the local power shortly after the Welles' broadcast begins, so the characters here all miss a significant portion of the show. Notably, the disclaimer that it's fiction. Between the raging storm and the threat of an alien invasion, the people are all put under an enormous strain and their ongoing emotions and tensions that have been restrained just under their skin are let loose. It's an excellent study of social classes and human dynamics under duress and, with the way the story progresses, it really keeps the reader on his/her toes not giving them much to predict the story's outcome. Tuazon's artwork did take me a bit to get used to. He works here in a loose, scratchy style which I'll admit isn't what I'm generally drawn to. That said, though Tuazon's character delineations were surprisingly clear and he was able to consistently portray the characters as unique individuals even with a few pen strokes. The storytelling, too, is generally very smooth; I only stumbled briefly around the introduction of Marvin. Ultimately, what I really liked about the book was that it had a number of really strong characters, and it was those characters and their interactions that drove the plot. But more, the characters were all expounded on by their actions in the story itself; we learn about them all by what they do. A strong plot that's driven entirely by strong characters. Using "War of the Worlds" as a hook might not have been necessary but it does make for an interesting lure for readers who might otherwise pass this one by. And that's something that we should ensure happens as infrequently as possible: The Broadcast is definitely NOT one that should be passed by.